The paphiopedilum I brought back from Madeira has bloomed, five very cheerful and healthy flowers. The plant seems happy with the limited amount of winter light it gets on my kitchen windowsill, though I can’t say the same for the phragmipediums I brought back, which need more light. All the inflorescences on those two plants cacked. This is one of the plants I bought at the farmer’s market in Funchal, with no label. My friends Jocelyn and John tell me it looks like a paph insigne, Jo thinks it might be a primary hybrid of some kind because of the deep shade green in the bloom. I pulled the picture on the left below off the internet. 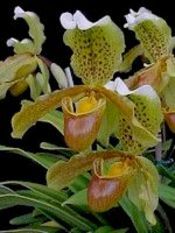 It’s a paphiopedilum insigne. The picture on the right above is my plant. Five nice blooms!